This is a preliminary application to introduce you to the club. If you have interest in becoming a member of the Buffalo Soldiers Motorcycle Club (BSMC) New Mexico Chapter, your presence will be required to present your case for membership to the General Membership of the Club. Are you a past or present member of any other motorcycle organizations? 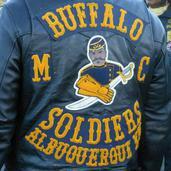 Why are you interested in the Buffalo Soldiers Motorcycle club? Have you ridden with a group before?